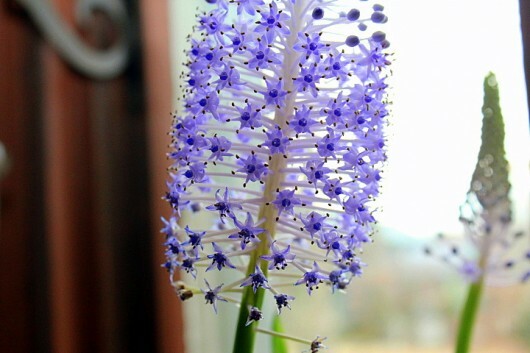 One of the prettiest plants in my window garden just now is Scilla Madeirensis. 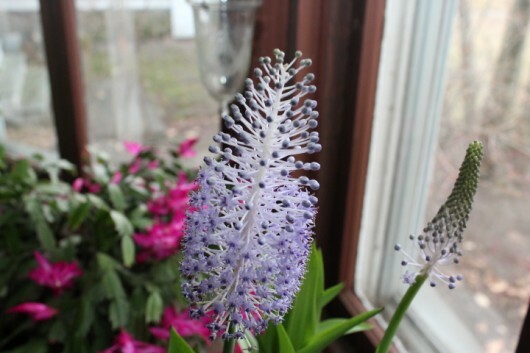 I planted 3 bulbs of this “Giant Squill” in early October, and six weeks later they greeted me with spectacular clusters of celestial-blue: Madeirensis is named for its native habitat: the island of Madeira, off the coast of Morocco. There, in autumn, it sends up 2-foot tall, cone-shaped flowering stalks above pointed, purple-speckled, medium-green foliage. 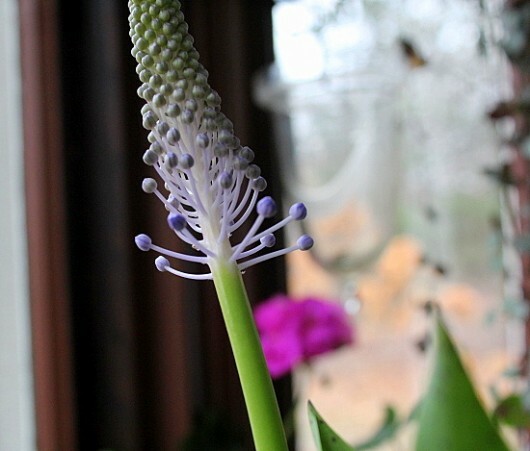 The plant grows to about half its usual size when confined to a pot in a window garden. 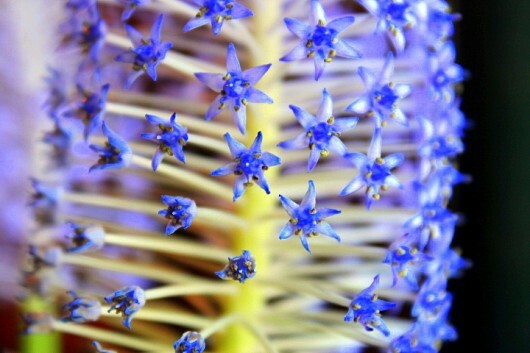 The blue cones, or “racemes,” are composed of hundreds of tiny flowers. These, as you can see in the photo above, are equipped with six petals each. I should probably tell you that I received my tropical trio from Easy to Grow Bulbs (dot) com. They asked me to test Madeirensis’s winter-forcing potential. On October 2, 2014, a package 3 bulbs arrived in the mail. I promptly potted them. I promptly potted myself, too, by drinking a martini. The bulbs, as you can see, are amethyst-colored. Nifty, huh? All 3 subjects were planted in a crocked, 6-inch clay pot filled with an ordinary peat/perlite potting mix. Instead of burying the bulbs, I planted them half-in, half-out of the soil. 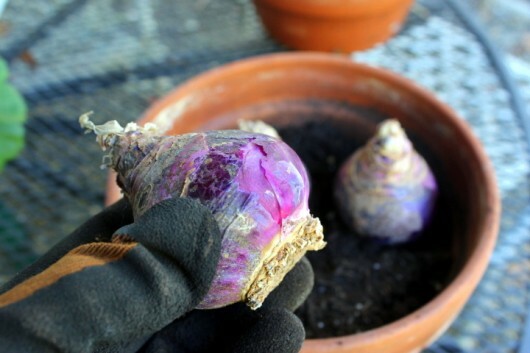 I plant amaryllis bulbs in the same manner. Then I saturated the potting mix, and placed the bulbs in my south-facing window garden. Mercifully, Madeirensis does not require a chilling period. The bulbs busied themselves making roots for 2 weeks. Then, wonder of wonders, the speckled foliage emerged. One bulb sent up a flowering stalk after 5 weeks had passed, and another after six weeks. The third bulb hasn’t flowered yet, but that’s a good thing. I’d rather have a lengthy succession of bloom than one big bang. The flowers are surprisingly long-lasting. In my cool window garden, which never exceeds 65°F, the racemes have remained fresh for nearly a month. The individual stars fade just as they bloom — from bottom to top. And yes, that’s snow outside my window. A nor’easter rocked my region over the Thanksgiving holiday. 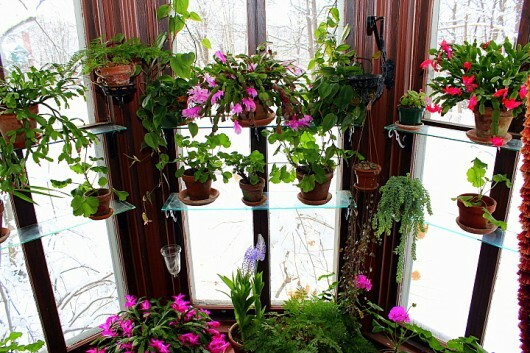 Are you fond of winter-blooming houseplants, too? Talk to me in the comments field below! These are simply lovely, delicate and cheerful! I may be on a search for these bulbs for my window garden. I love having blooming plants during the winter, so of course I love your Madeirensis. I also didn’t realize Christmas cactus came in red! I will be looking for both plants. I am going to order some of these! I am guessing I would have to treat them like amaryllis bulbs here in Montana? I do those in the house also in winter. Guessing I could never plant the Scilla’s outside here if they are from Morocco! Lovely flowers Kevin. Are they scented? Your window gardens are UH.MAZE.ING!! Just beautiful! I wish I had the space to do that! I love goldfish (nematanthus gregarius) and lipstick plants (Aeschynanthus radicans) for winter bloomers. They are happy plants in general and can bloom year round (or mine do at least)! 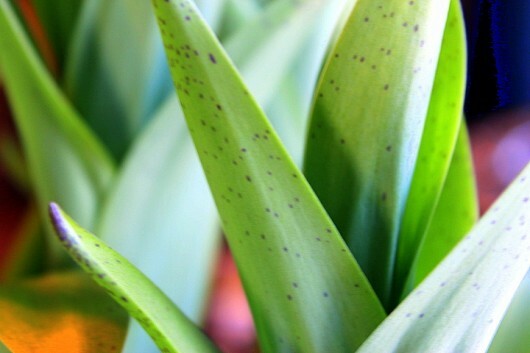 I’ve never heard of this type of Scilla ! Really gorgeous. Splendid hue of blue. I have not forced any bulbs in several years, but this one could persuade me to try again. Did they tell you to plant them outside in summer and bring them back inside before frost? In winter I rely on the pale pink flowers of Oxalis triangularis, the red Hibiscus rosa-sinensis, the dining room’s (name forgotten) Palm with its reliable wild yellow poofs of flowers. The overwintering Coleus cuttings usually try to send up a flower stalk, too. Without more floral fanfare, I turn to foliage houseplants for amusement and then start my seeds to occupy my plant obsession in the dark, snowy months. Where can I buy the bulbs? 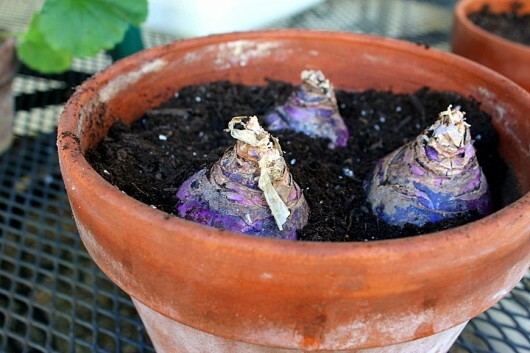 Considering all your encouraging articles, I launched my own bulb forcing regiment and have both Narcissus and Hyacinths in my downstairs fridge (my wife is not altogether pleased) and in the window, you can find 3 Amaryllis bulbs and a pot of Paper Whites. Should be a bloomin’ good winter! Thanks for another look at your winter garden. What a beautiful blue for those flowers. 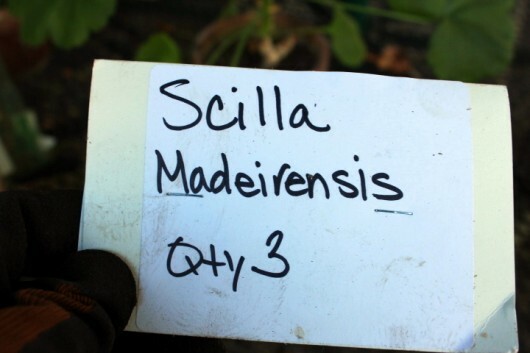 Would you happen to know anything about started the seeds of Scilla? I collected some from my client’s garden and was hoping to start them this year. Do you have any suggestions? Drimia maritima / Giant White Squill. When the bulb arrived at my home it was around 7lbs! Giant White is native to the Mediterranean seacoast, zone 8-10. 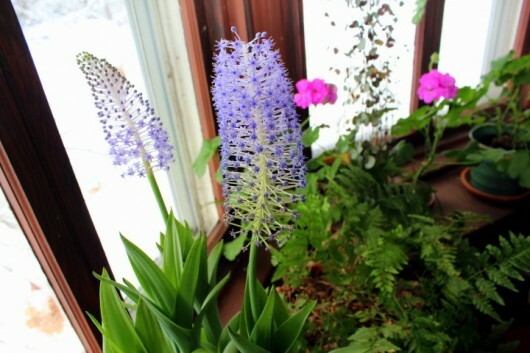 Some say it is difficult to grow indoors but so far in my home in Vermont my Giant White Squill is a foot high. It is very maintenance free once you find a pot large enough and a sunny space with lots of room for it 3ft long. You can read up on the details, otherwise this message will go on and on. 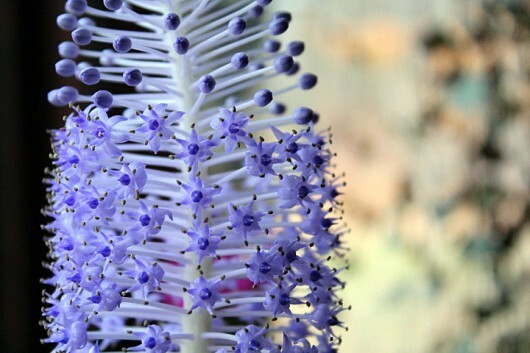 It has also had a number of other names including Scilla maritima,Urginea scilla, Urginea maritima, Maritime Squill, Sea Squill and White Squill. I got my giant bulb from Fedco Bulbs from Waterville Me. I also buy my seeds etc. from them as well. Thank you for your enthusiasm about gardening. It makes me feel like I am not so crazy. These are absolutely beautiful! I will have to see about ordering some. Thanks for sharing! Beautiful and just what I will need in Jan or Feb. Off to my garden shop today, hope they have them but if not I may try to force a different ‘giant squill” Happy Birthday to you today, Your posts are a highlight of my days, so many great ideas. I wish I could visit your farm but alas I am on the west coast of Canada so not very likely. Also wishing you Happy Holidays. Happy Birthday Kevin hope you have a wonderful day. 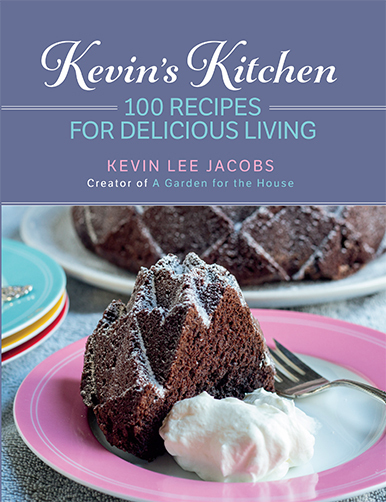 I enjoy getting your emails and the recipes are the best. Thanks for sharing. They are beautiful. Thanks for sharing..
Beautiful and so delicate. Love the pictures. Beautiful!!! Same question as another poster, though. Scent? You have expanded my world. I’ve never seen this bulb before. Lovely. 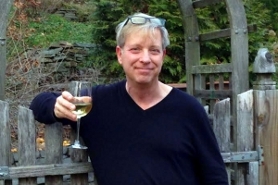 Kevin, I love your site and sense of humor! I have saved all emails in a separate file so can look up (especially recipes) very quickly. Keep up the great work. These are great. I was able to obtain one about a month ago from Longfield gardens, although it’s so cool here right now it’s barely growing. I know that mine is a clone. Does anyone know of a source of seeds or seedlings? I’m guessing that the flowers aren’t self-fertile?